Today more than 50 million Egyptians started heading to the polls to cast their votes for an independent Parliament, many for the first time in their lives. The revolution in Egypt, which captured the attention of the world beginning in Tahrir Square on January 25, 2011, made this possible by opening the floodgates of political participation. With the free flow of information online, people can connect and engage in a open dialogue about the future of Egypt. The web is enabling many new voters to become better informed on their choice of candidates, and letting politicians reach electors in new and exciting ways. Getting information about the new rules and the new players is no small feat for Egyptians: there are nearly 11,000 candidates vying for 498 seats across 27 governorates nationwide during a multi-stage election that started today and lasts until March 2012. We’re doing our best to organize information to make it easier for voters to find everything they need in one place. 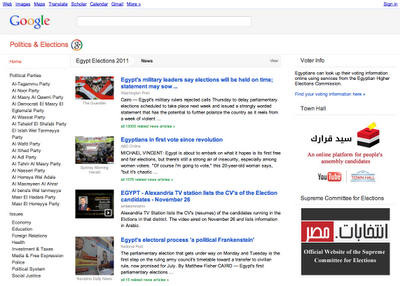 For example, millions of Egyptians have learned where they can vote through our landing page, www.google.com.eg/elections. We’ve also worked to give a voice to thousands of candidates to reach voters through interactive video. The YouTube Townhall includes nearly 400 videos posted by candidates and political parties explaining where they stand on issues from education and the economy to health care and political reform, sparking vibrant conversations in cafés from Alexandria to Aswan. We’re helping voters and politicians connect not just in Egypt, but throughout the entire Middle East and the world. For Tunisia’s recent parliamentary elections, we partnered with startup news portal Tunisia Live to offer a training workshop in Tunis on Google tools and social media for politicians. In France, we set up a special YouTube site for the upcoming parliamentary elections. The Internet is playing an increasingly significant role in Egypt. It’s bolstering civic engagement and becoming a powerful mechanism for information sharing—crucial to helping the nation make the tough transition to democracy.